When it comes to travelling and picking a hotel to stay at, the key question is how to balance comfortable accommodation with value for money deals. If the boisterous hostel-life is not your thing and 5 star hotels seem too stuffy, choosing a 4 star property is great compromise. Novotel Bangkok Platinum Pratunam is here to be your preferred 4 star hotel in Bangkok. Why? By offering both value for money and impeccable service with attention to detail, of course! Each of the Novotel Bangkok Platinum Pratunam’s 288 rooms showcases design with a modern sensibility. 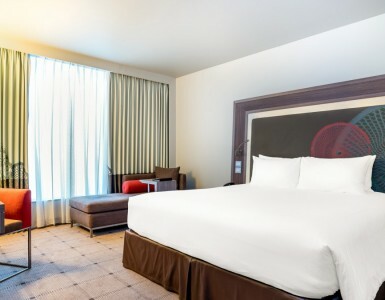 Every spacious room boasts great city views and business travelers and leisure-seekers will equally feel welcome. Be pampered with the calming decor, comfortable bedding and eco-friendly amenities! Also included: Free WiFi internet and a complimentary handy smartphone. If you’re a family or a larger group, ask for one of our connecting rooms or even the spacious Executive Suite. All executive rooms come with Premier Lounge benefits that include VIP check-in/check-out and access to the exclusive lounge on the 6th floor. Another highlight? All day refreshments, gourmet breakfast and complimentary daily cocktails and canapes. No hotel stay would be complete without enjoying the pool! At Novotel Bangkok Platinum’s case, the pool is a stunning infinity-edge outdoor pool on the 9th floor. The spectacular sunset views of the Bangkok city skyline go well with a cool cocktail. Make it a truly relaxing time by booking a poolside massage. Or grab a bite and a refreshing drink at any of our three outlets. There’s BAR9 Beer Garden on the 9th floor, or chic The Lounge and the buffet bliss served at The SQUARE Restaurant on the 6th floor. Don’t miss a chance to try our always changing daily fresh seafood buffets here! Thanks to a city-central location in Pratunam district, guests are right where they need to be to shop. True shopaholics will delight in the markets and shopping centres of Bangkok. Nearby Airportlink, BTS skytrain, expressway and even commuter boat connections means exploring more of Bangkok is convenient. With a perfect combination of location and quality accommodation and service, it’s clear that Novotel Bangkok Platinum Pratunam is the ideal choice for your next 4 star hotel in Bangkok!